Want to hear from us about events at the church? Encompassing 325 acres, Caldecote is probably one of the smallest villages in Hertfordshire, bounded on the north by Hinxworth, on the south by Newnham, on the east by Ashwell, and on the west by Bedfordshire. The Domesday Book of 1086 recorded that the manor of Caldecote was held by Ralph (Ranulph) de Limesy, a Norman lord, who may have come here with William the Conqueror and was awarded substantial grants of land in Hertfordshire and beyond. The manor of Caldecote passed down through Ralph’s family until approximately the latter part of the 13th century when the last in line, an heiress named Basilia de Limesy, married Hugh Oddingselles, a Wiltshire land owner. Their son, Sir John Oddingselles, surrendered his rights to the manor of Caldecote to the Abbot of St Albans, in 1321. Following the Dissolution of the Monasteries the manor reverted to the Crown in 1539 and was subsequently sold, in 1540, to Sir Ralph Rowlatt, Master of the Royal Mint as well as Sheriff of Hertfordshire. Caldecote is a deserted medieval village. The site was largely abandoned in the aftermath of the Black Death, which claimed 64 lives between 1348-49. In the 19th century the population had dwindled down from 49 in 1855 to just under 20 to-date. An archaeological excavation between 1973-77 revealed evidence of a pre-historic settlement (numerous artefacts from Bronze and Iron Ages were found), with continued occupation since around 1050. These days the hamlet of Caldecote consists of six former farm cottages, recently modernised, a manor house and a church. The church, dedicated to St Mary Magdalene, still bears evidence of an earlier Norman stone/flint structure, but owes its current look to the 14th century re-building in clunch, which also included an addition of a tower and a south porch. The church, which is a grade II* listed building, was declared redundant in 1974 and was vested in the Friends of Friendless Churches charity in 1982. The church measures 51 feet in length and 14 ½ feet across and is probably the smallest church in Hertfordshire. Its most notable feature is a 15th century canopied and at one time richly ornamented holy water stoup in the south porch. The font dates from 1480 and the pews from the same era. A list of rectors dates back to 1215 (when records began) and a small window in the south wall has in it what is known as “poor man’s stained glass”, now sadly badly decayed. The surviving fragments of medieval stained glass were mounted into two small lights in a south window: one of them bears a headless kneeling figure of William Makeley, a priest here in 1415. There are only 16 gravestones in the churchyard now, most of them in memory of the Flint and Inskip families, the latter of which held the manor of Caldecote as well as the advowson of the church in the 19th century. A plaque to the memory of Thomas Walker Hobart Inskip, the 1st Viscount Caldecote, is inside the church. He is buried at the east end of the graveyard. Despite its diminutive proportions our little church is full of new secrets to discover. There's always something new to unearth or a part of its history that we can shed new light on. \Have at peek at our latest discoveries on our blog. Throughout the year Grazyna, our resident expert on the history of our church gives tours of the church as well as talks on its history to local interest groups. Our church plays host to a variety of events from our Fuchsia Festival and Open Days to our popular annual Carol by Candlelight service. Everything we do allows us to help to keep our church in beautiful condition for generations to come and explore its history further. The Church of St. Mary Magdalene is owned and managed by the Friends of Friendless Churches, a charitable organisation that cares for a number of redundant churches up and down the country to preserve them for future generations. You can see more of the properties in their care on their website and explore a wealth of additional historic buildings. Caldecote Church Friends are a small group of volunteers, founded by Peter Robbins in 2007, that assist the Friends of Friendless Churches in their work and focus specifically on our church in Caldecote. We raise funds to help improve and restore the fabric of building, run events in the church, help with the upkeep and research the building and its history to present to interest groups and visitors. 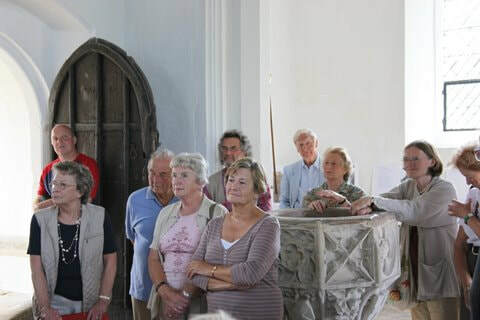 All money received by Caldecote Church Friends is used to help improve and restore the church for future generations.